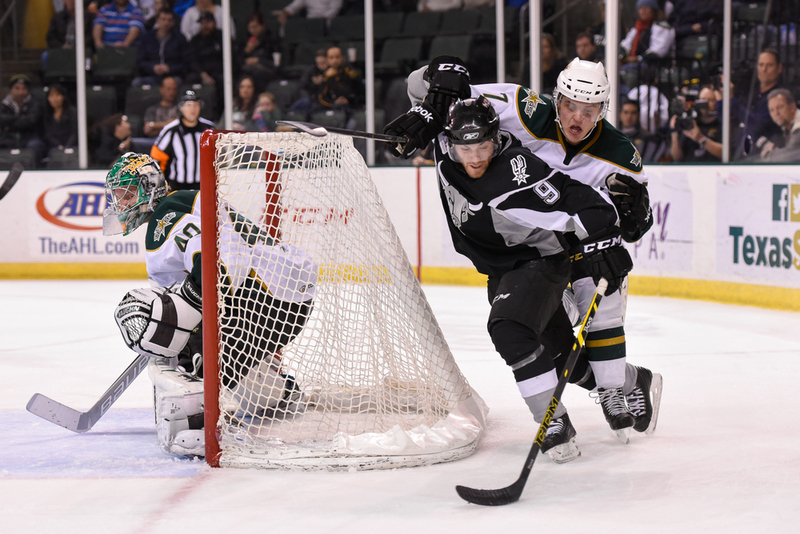 The Texas Stars played one of their top rivals, the San Antonio Rampage, last night. The Rampage have a great team this year and they have proven quite a difficult adversary for the Stars to conquer. Things looked good for the Stars early in the game as they took a 2 goal lead. However, the Rampage rallied strong in the third period and relentlessly pounded the Stars' net to tie up the game. The Stars would ultimately fall to the Rampage late in the overtime period. My first shot here is the Rampage net view as the Stars attacked in the 2nd period. I thought the expression of the guys in the crease was great. Ranford did his best here to screen the goalie and keep the Rampage defenseman distracted. In the second shot, Honka tightly covers his man to ward off a wrap-around scoring chance in the 3rd period. The final shot illustrates the intense traffic around the Stars' net in the final frame of regulation play. Fortunus kept this puck out of the net.